You see, I have been the slowest to catch on to the cold shoulder trend. I know, its been around for a while and is continuing into fall fashions. I was meeting my hubby for pizza one night and had some time to kill. So I decided to do some window shopping when I saw and tried on this RTW top.. and loved it. So.. 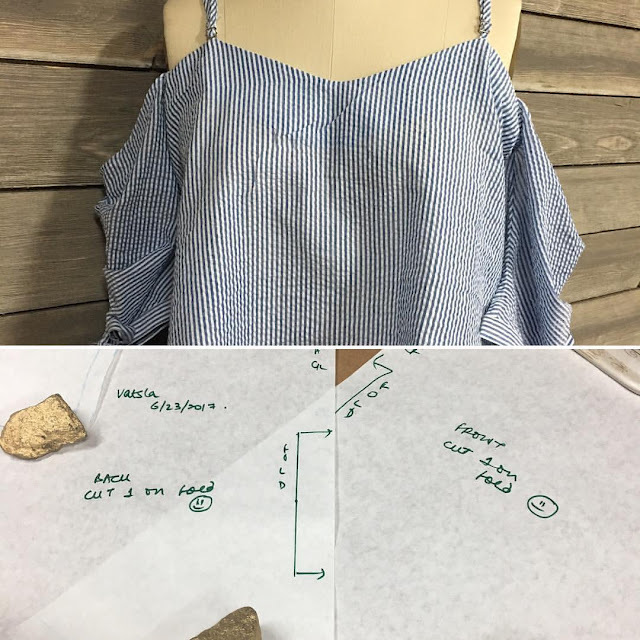 I made a pattern... and found the perfect fabric. And made my own version! I really do love the tent shape of this top. It is very different than the usual type of garments I make and wear, which typically tend to be more fitted. I drafted a facing and modified the sleeves a bit by removing the band at the bottom and hemming them instead. I also made the straps a fixed length as opposed to adjustable. Overall I am pretty happy with the way the top turned out. 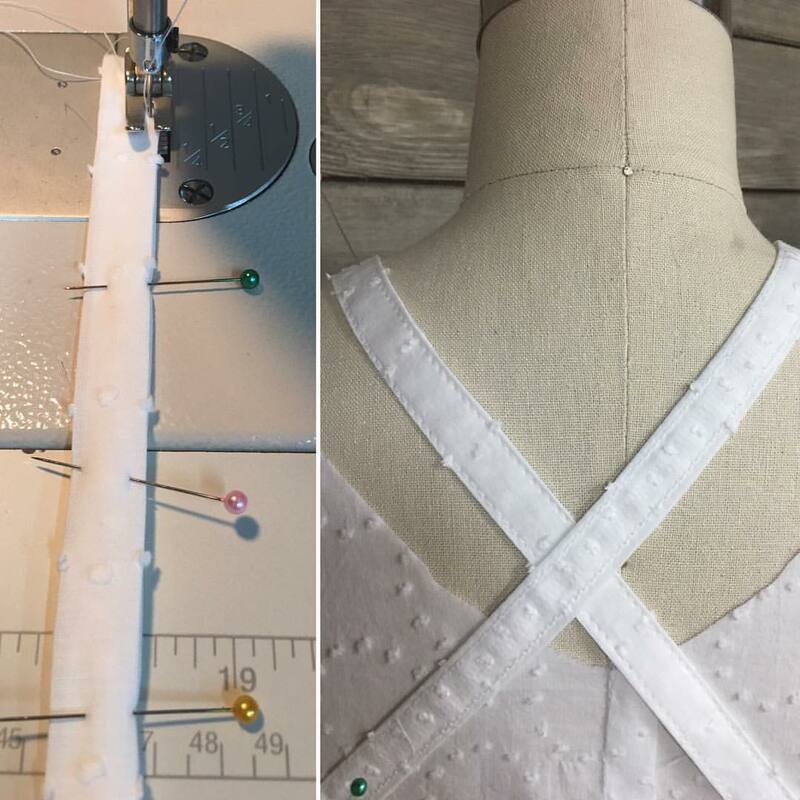 I topstitched all around the neckline to ensure the facing was sitting down. I actually started making another version in a white cotton, but that one is still a work in progress. I may or may not get to wear that one this year! I hope you enjoyed this make! I am going to work on some maxi dresses next! Fall is coming!! Hope you are enjoying the cooler weather. I sure am! Beautiful top! I love everything about it but especially the sleeves, cold shoulder look and the fabric is gorgeous. I don't think seersucker will ever go out as a cool summer fabric that always looks so crisp and fresh. Kathleen, Thank you. I agree. I want to sew with it some more. It looks adorable. I love the way the on-trend top meshes with the classic seersucker! 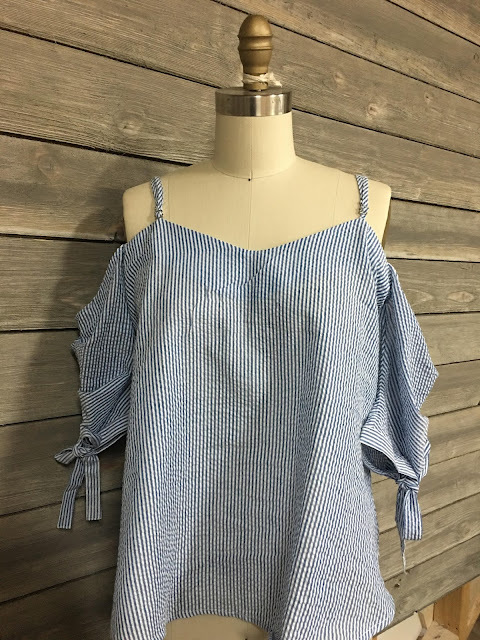 Lovely seersucker cold shoulder top! Great job in drafting this! I love your version of the cold shoulder look. The sleeves are beautiful. You are definitely talented to be able to draft your own pattern.